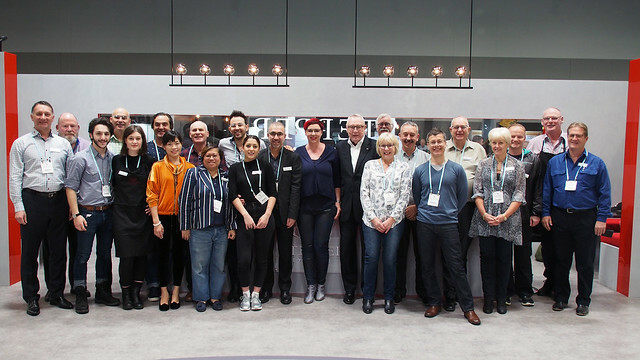 This year, the Southern Regional Congress (SRC) was a unique experience for the Australian optometry industry, with a change of venue from the large, maybe too large, Melbourne Exhibition Centre, to the smaller, maybe too small, venue at the Mercure Pullman Hotel in Albert Park. With this new scenery came a set of unique challenges for the organisers, Optometry Australia; delegates fought to get to all the relevant seminars due to tight schedules and many were required to huddle in the back of the seminar room due to a lack of seating. Exhibitors also struggled with an unusually late bump in time and the one service lift available to transport all booth/stand components to the Exhibition floor. This meant some staff, myself and my team included, working through the night, completing setup in the early hours of Saturday morning. With these delays, there were, of course, nerves that the stand would not be ready for the delegates arrival at 8:30 am the next morning. But with the exceptional custom stand installers, "Live Brands", the dedicated team from Optique Line Roy Parker, Deborah Burgoyne and myself, and of course, the champagne, water, and bag of almonds to keep us going, the stand was completed in time and looking marvellous. Our Optique Line stand was one of the largest at SRC this year, with a blend of clean lines and statement colours of Gold and Black to stand out against a sea of white booths surrounding it. With all the teething problems that this new venue presented for the organisers, the result was still impressive providing Optique Line Director, John Nicola along with Account Managers Roy Parker and Andrew Craib the opportunity to meet new and the existing business partners and to present the latest exciting releases from Optique Line's brand portfolio includng, Stepper Eyewear, Convertibles Eyewear, Mad In Italy, AuraFlex, Gemini Collection and Gemini Essentials. So the question still remains, was SRC 2016 a hit or a miss? For Optique Line and the positive feedback we have received, undeniably it was a hit. Yes, there were obvious issues due to a smaller venue this year, but we expect lessons were learnt and for SRC 2017 subsequently to run a lot smoother. We are excited about being part of the new improved SRC exhibition next year and very much look forward to seeing you all there.